What a delicious way to get in veggie servings and TONS of fiber that will keep you full! 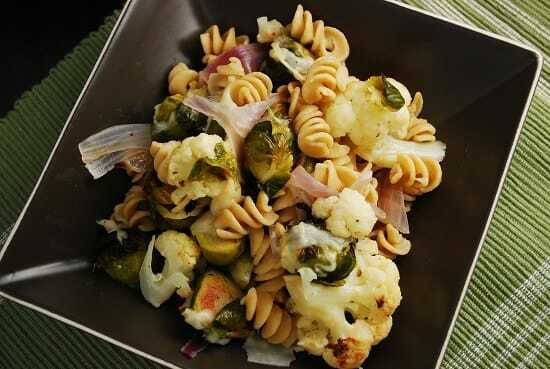 This Pasta with Roasted Brussel Sprouts and Cauliflower Recipe is easy, beautiful and simply delicious. Keeping this dish sauce free allows you to fully enjoy the delicious roasted flavor of the vegetables. Though it’s not smothered in sauce, a light seasoning of olive oil, salt, pepper and Parmesan cheese helps to balance the dish without covering up the natural flavors. It makes a great Weight Watchers dinner recipe at just 6 Points per serving. All the fiber is very filling, so pair this pasta recipe with your favorite low calorie dessert, and you’ve got a complete Weight Watchers friendly meal. Enjoy! This easy and healthy pasta recipe is a complete meal at just 6 Points per serving. The flavors of the roasted Brussel sprouts and cauliflower are perfectly complemented by the Parmesan cheese and delicate seasonings. It’s a simple, yet hearty and delicious dish. Cook the pasta according to the package directions. Reserve 1 cup of the cooking water; drain the pasta and return it to the pot. Meanwhile, in a large bowl, toss the cauliflower, Brussels sprouts, and onion with the olive oil, thyme, garlic, parsley, and salt and pepper. Spray 1-2 large baking sheets with nonfat cooking spray and evenly spread the vegetables out over the sheet(s). Roast, tossing the vegetables once and rotating the sheets halfway through, until golden brown and tender, 15 to 20 minutes. Add the vegetables, Parmesan, ½ cup of the reserved cooking water to the pasta and toss to combine (add more cooking water if the pasta seems dry). Season with additional salt and pepper as desired. I absolutely LOVE roasted Brussels Sprouts and have been looking for a recipe that uses them with Pasta! I had brussel sprouts for the first time last week, and I am in love!